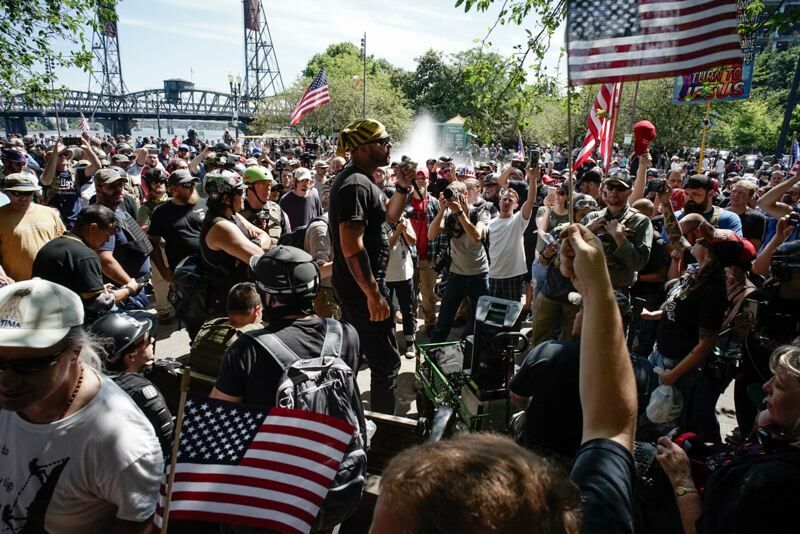 The rally between Patriot Prayer and Antifa takes place on Saturday, August 4 on the Waterfront. • Robert Joseph Majure, 27, was arrested near Southwest Naito Parkway and Columbia Street on charges of harassment and resisting arrest. • Tracy Lynn Molina, 45, was arrested near Southwest Second Avenue and Columbia Street on charges of second-degree disorderly conduct and attempted assault on a police officer. • Tristan Isaac Rominemann, 28, was arrested near Southwest Naito Parkway and Columbia Street on charges of interfering with a police officer, second-degree disorderly conduct and harassment. • Joseph C. Evans, 34, was arrested near Southwest Second Avenue and Jefferson Street on charges of recklessly endangering and unlawful use of a weapon. "Unfortunately, today, some people chose to commit illegal acts of violence, which required members of the Police Bureau to take action in order to keep all participants and non-participants safe," Police Chief Danielle Outlaw said in a statement. "This was a dangerous situation for all those involved, including officers, and I am disheartened that this kind of illegal behavior occurred in our beautiful city." Police used pepper spray, rubber bullets and other "less lethal" projectiles and made several arrests after a crowd of counter-protesters ignored orders to disperse from an area near where a "Freedom March" was being held by conservatives. Dozens of flash-bangs could be heard echoing on Columbia Street and videos showed a line of officers in riot gear charging the retreating crowd of Antifa members, which police said had been tossing bottles, rocks, smoke bombs, firework mortars, other liquids and using a slingshot. Police said the "tumultuous" and "assaultive" behavior required the presence of nearly every on-duty police officer, and that non-emergency calls were routed to other city departments for a portion of the day and evening. 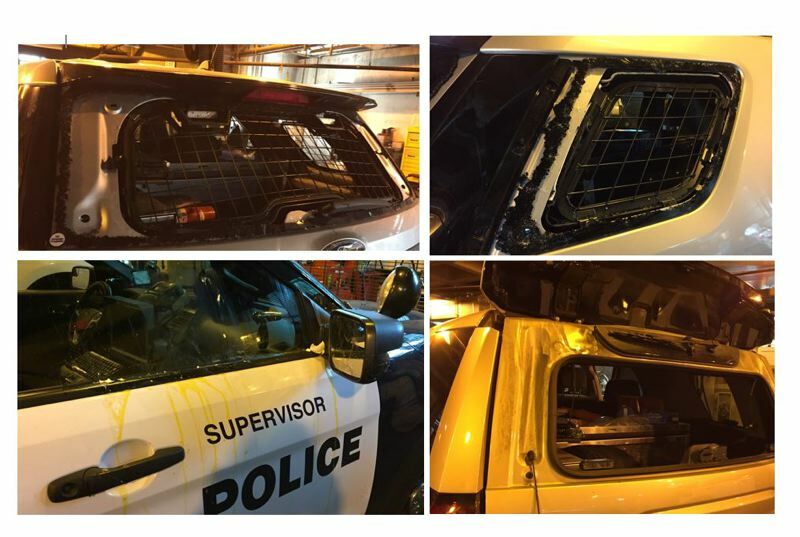 No officers were injured during the fray, though three police cars were vandalized. Raw Story reported that an anti-fascist counter protester was sent to the hospital with a "head wound" caused by a flash-bang grenade canister fired by police at close range. "The hit would have been lethal if he wasn't wearing a helmet," his girlfriend told the website, which did not identify either of them. Photos associated with the incident showed the bloody back of a man's head and what appeared to be a metal container protruding from a large hole punched in a black helmet. 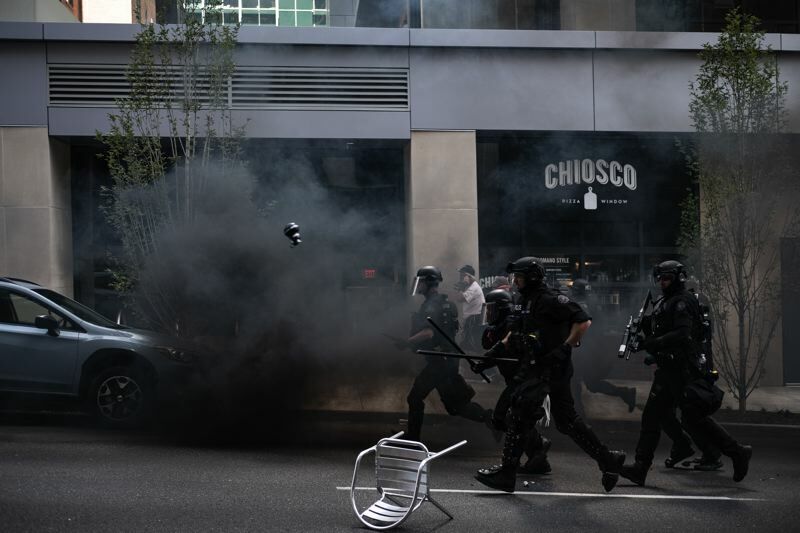 A "civil disturbance" was declared and protesters on both sides were ordered to disperse from downtown after Portland Police said members of a mob began to hurl rocks and bottles at officers. 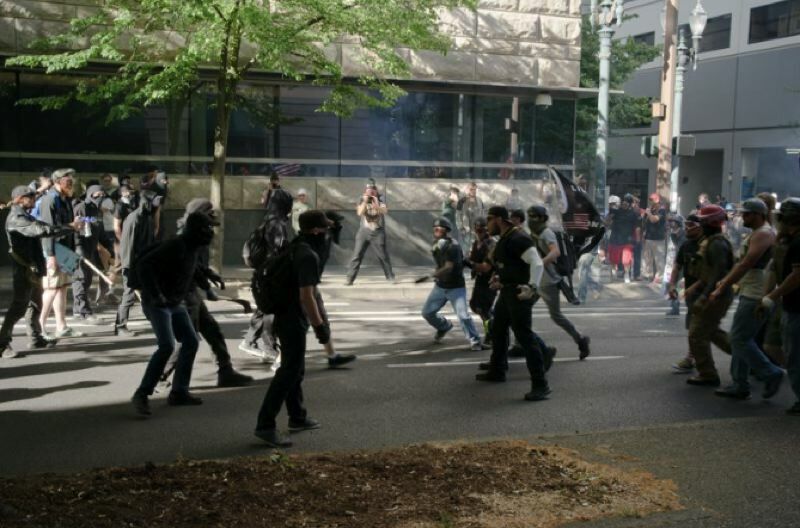 Flashbangs rang out and the authorities appeared to deploy pepper spray shortly after 2 p.m. as they subsequently moved to clear Southwest Columbia Street at the intersection with Naito Parkway, where a large mob of Antifa members had been halted by a police line. 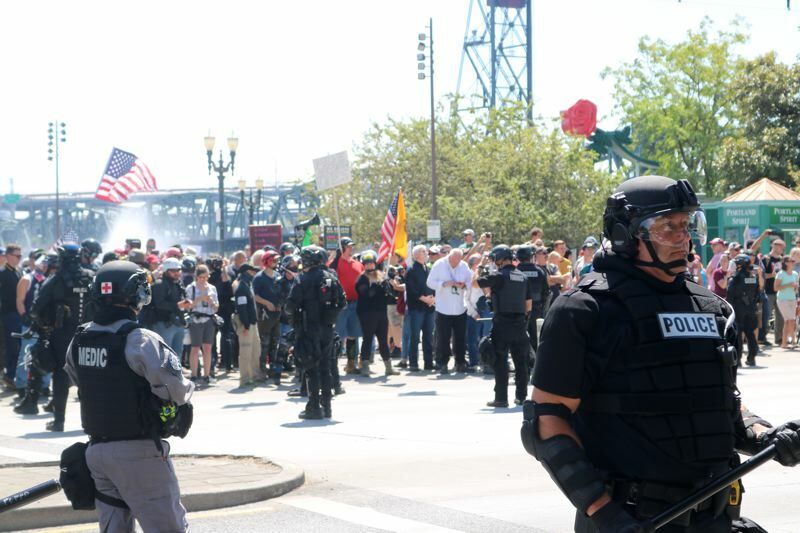 Standing across street along the border of Tom McCall Waterfront Park, members of the right-wing Patriot Prayer group were untouched by the crowd control measures. It was not immediately clear if both sides were throwing projectiles. Eder Campuzano, a reporter for The Oregonian, said he was livestreaming a social media video from the Antifa side when he saw a "part-empty plastic water bottle spinning toward me." Photos posted to Twitter showed blood on his head and dripping down onto his arms. Campuzano wrote that he did not see who threw the bottle, but that it must have been someone standing behind him, closer to the intersection of Columbia Street and Southwest First Avenue. That area was primarily populated by members of the left-wing protest group. Campuzano indicated that he would visit an urgent care but also said he did not believe his injuries were serious. At least several other people were also injured, but officials have not yet released a final tally. Despite the violence, Saturday's uproar was a far cry from a riot about a month ago, when packs of anti-fascists and President Donald Trump supporters openly clashed on the streets without immediate interference by law enforcement. Police officers served as a human wall on Saturday, August 4, preventing almost anyone from either group from crossing the four-lane boulevard. The moving cordon went into effect as soon as the anti-fascists marched from their rallying point at Portland City Hall. 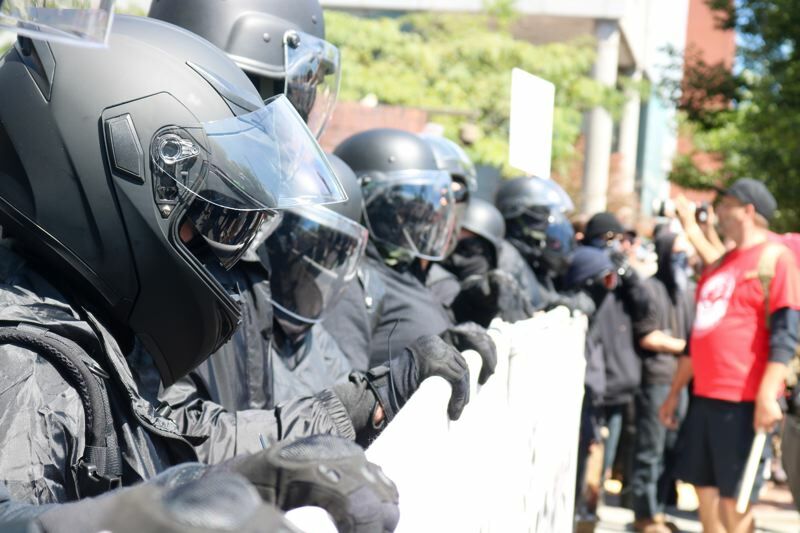 Police later shadowed the right-wing group when they left their staging ground in the waterfront and marched south on Naito and then west on Market Street. 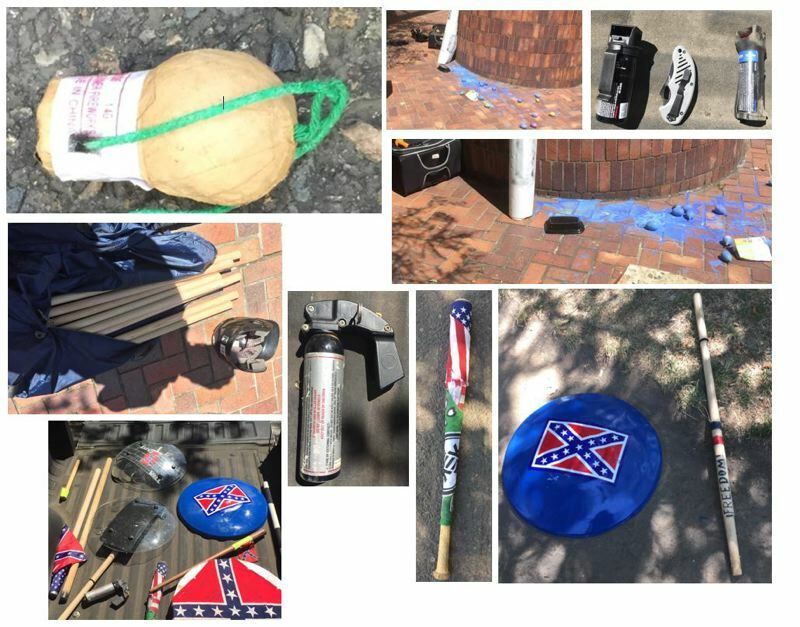 The Portland Police Bureau said they confiscated knives, fireworks, poles, pepper spray, mortars, baseball bats and homemade shields during the course of the day. The size of the combined crowd was probably no more than 1,000 people. 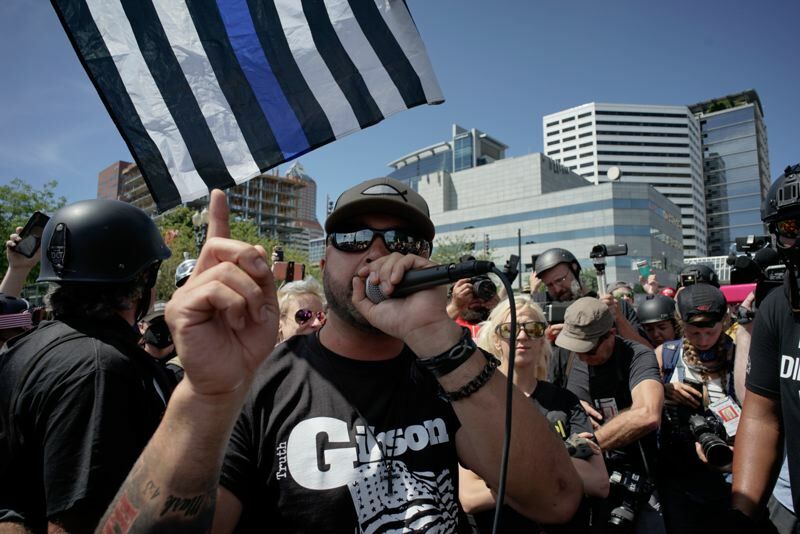 Joey Gibson — leader of Patriot Prayer and candidate for U.S. Senate in Washington — called for a "revolution" in a speech near the Salmon Street Springs fountain during the conclusion of the day's hurly-burly. "I have prayed about it. I envision a true revolution in this country where we don't have to hate one another just because we have differences of opinion," he said. "Where we can truly come together, where we can unite and understand that this empire above us has gotten way too big." 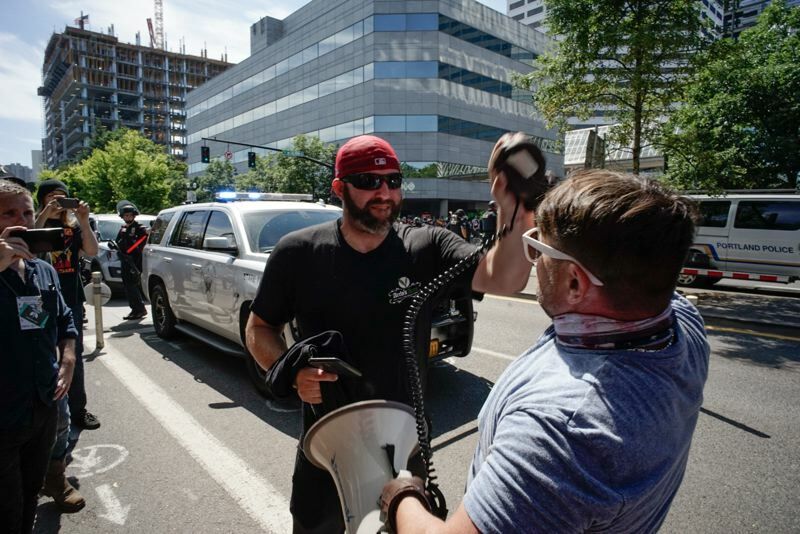 Kerry Hudson — a familiar face at Patriot Prayer events — told the Tribune one of his ribs was broken by an apparent Antifa member during a violent assault that was captured on video during a rally in Portland on June 2. Yet the Tacoma, Washington resident said he was undeterred to attend again. "If I let that kind of stuff put me on the ground, out of the game — then I'm here for the wrong reasons," he said. "What we want to do is get along with them or at least dialogue with them. You can't dialogue when you're throwing fists." Gibson asked his supporters to vote for him in the Washington primary on Tuesday, Aug. 7. His next "Freedom March" is scheduled for Aug. 18 in Seattle. "I am sick and tired of the leadership in the Democratic Party pandering and race baiting and trying to make us feel bad for being American, freedom loving and to believe in the Constitution and to believe in God," Gibson said. "We're not going to stand down any more. Especially not in Portland, Oregon." Portland Police have blocked off Southwest Naito Parkway, preventing the crowd of anti-Patriot Prayer protesters who marched from City Hall from reaching the right's gathering spot across the street. "Southwest Naito is closed. The pedestrian crossings are closed. Remain on the sidewalk," a police officer with a megaphone repeated around noon. "Failure to follow this order may result in the reasonable use of force to enforce this order," the spokesman continued. A few minutes later, he said officers have observed people on the west side of the street with weapons and warned that everyone must leave the area immediately or may be subjected to "riot control agents or impact weapons." Many people are not heeding the police's commands. The bottleneck leaves both sides eyeing each other warily from across the street. Numerous police officers wearing riot gear and carrying batons are blocking the street. There are some clowns interspersed with black-clad Antifa members and other nonaffiliated protesters stuck on the west side of Naito. "I think it's important to fight white supremacy with everything you've got: What I have is joy, music and a rubber nose," explained a clown who gave his name as Bug. "I try not too take anything to seriously, because if you don't you get stuck down there in that place of hopelessness." 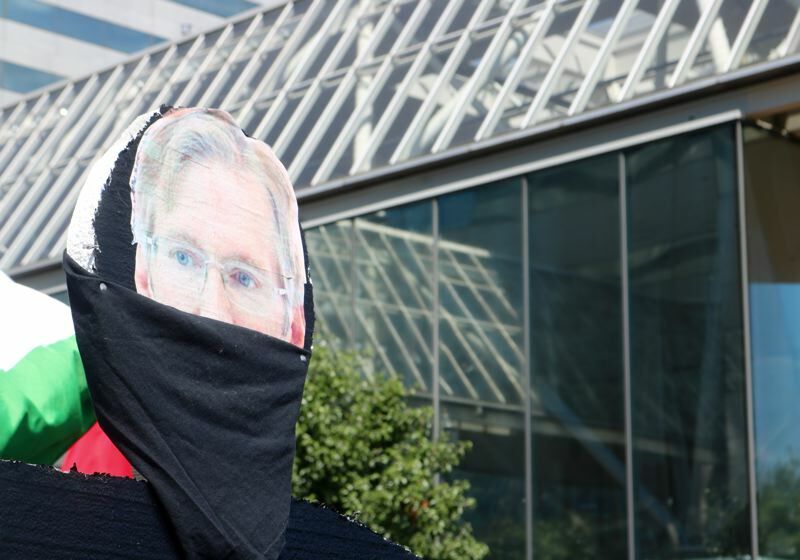 Antifa members are also carrying a large effigy of Portland Mayor Ted Wheeler, which they've dubbed the anti-mayor or "Ned Wheeler." "Ted tolerates Nazis," one protester wearing black and a mask said. Previously, at City Hall, Angelica Lim with the International League of People's Struggles gave a rousing speech from the steps of the civic buidling. Lim identifies as a militant queer Filipino mother. "Use your skills and get organized. We have a world to win!" she orated. "The fascist bad boys — they are a tool of the global elite." The Portland Police Bureau is hoping to box in a planned protest between members of the left and the right. The fence is intended to create "a safe space" for people to express their First Amendment rights, according to a news release. "Everyone attending the demonstration and counterdemonstration are encouraged to obey all laws and be respectful of others who are using city streets, freeways and mass transit," a spokesperson wrote. "Marching into and blocking streets without a permit is illegal and dangerous to protesters as well as road users and has a significantly negative impact to our community." Police say no one will be allowed to bring any weapons or "visibly displayed" guns into the fenced zone, including those with valid concealed carry permits in Oregon. Police say the rule applies to rifles, shotguns, other types of long-gun firearms. The fence runs from Salmon to Morrison streets on the north, west and south sides of Tom McCall Waterfront Park. By 10:30 a.m., several hundred have gathered outside City Hall for an anti-Patriot Prayer rally organized by a new face in the Portland portest scene: Popular Mobilization — or POPMOB for short. Camera crews, sign-holders, a contingent of socialists and many others are outside the civic building located at 1221 S.W. 4th Avenue. Mitzi Yates, one leftist protester, said the people in the crowd are the "true patriots." "We are being owned and controlled by the rich," she said. "This is my country." "We do not need out of state people coming down here trying to disrupt our city," added her husband, Phil. "They're bringing messages of hate and that's not what we need. There's too much work to do." 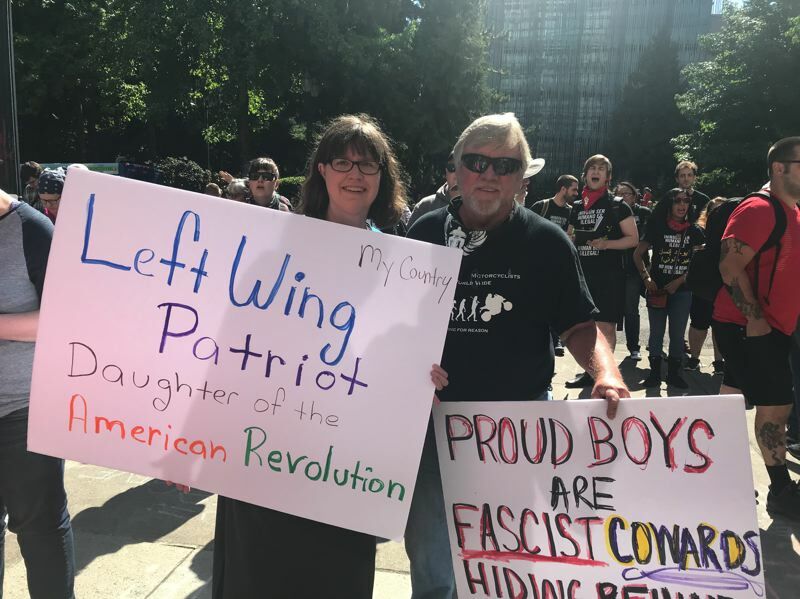 All eyes are on the waterfront as Portland prepares for the expected confrontation between Patriot Prayer and Antifa on Saturday, August 4. Whatever happens, the event promises to be an all-out display attended by hundreds or thousands of protesters, counter-protesters, onlookers, bystanders, local and federal law enforcement, credential media and citizen journalists, politicians and clowns. At least 40 "colorful folk" are expected to appear in Chapman Square for some light tomfoolery at 11 a.m., according to an event page on social media. "We are hopeful that making a mockery of their ilk will do a better turn than fisticuffs," wrote the Unpresidented Brass Band. "Please come and clown it up while standing up for peace and reason!" Commissioner Chloe Eudaly said on Twitter that no city permits are required to assembly on the waterfront. She said she would attend only the beginning of the rally outside City Hall at 10:30 a.m. in order to encourage others to leave as well. 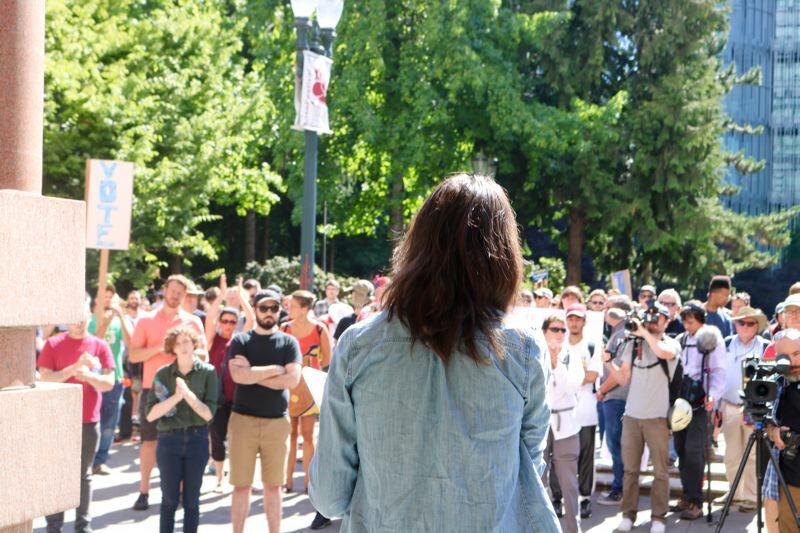 "I strongly encourage Portlanders to consider staying away from this event and instead engage in a day or weekend of action," she said in a statement. "There are limitless ways we can creatively and peacefully demonstrate [that] hate, bigotry and intolerance is not welcome in our city." Dozens of anti-Patriot Prayer posters have popped up in different parts of the Rose City. Others took to social media to criticize the sensationalistic tone of national pre-rally coverage, which has been described by the Southern Poverty Law Center as "the next Charlottesville." Rumors swirled that conspiracy monger Alex Jones would attend today's protest. Instead, it was InfoWars reporter Owen Shroyer who announced his arrival in Portland on Aug. 3. The site is known for spreading outlandish lies while hawking health supplements to its credulous readers. Check back here for frequent updates from the Portland Tribune throughout the day. For more background information on today's demonstration, click here.